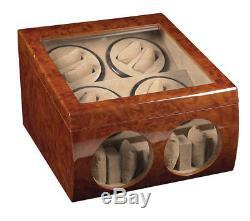 AUTOMATIC WATCH WINDER BURL WOOD DUAL DOUBLE QUAD 8 + 4 STORAGE DISPLAY CASE BOX. Motorized turntables keep your watches wound and ready to wear! For many discerning people, it's not enough to just have a watch case for our finest jewelry. Today's most extravagant timepieces come equipped with automatic movement. That means they never need batteries and never need to be wound by hand. They're powered by the movement of your body when you wear them. But what if you have different watches for different occasions? Chances are your watch will stop from extended periods of non use. 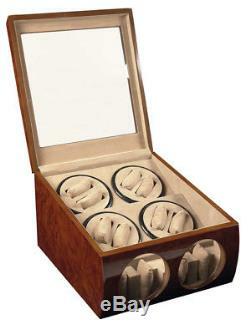 Our specially designed automatic watch winder will keep your favorite watches wound and ready for when you need them. A silent motor and gear keeps the watches moving under a display. Our watch winder's convenient "Auto-Daily-Repeat" feature ensures that your watches will be fully wound and ready to wear anytime, everyday. A unique feature that could hardly be found in other watch winder brands. Featuring precision-engineered, state of the art design which will please anyone with an un-compromised taste of quality and luxury. The different finishes offered will complement any watch. Its elegant and luxurious design blends perfectly with any fine furniture or decoration of your home or office. Our watch winder is the perfect accessory for your watches. The case is handcrafted of lacquered hardwood veneer. Perfection doesn't come over night. Eight layers of high-gloss lacquer are applied. Each layer of lacquer is allowed to cure for 3 days before being sanded and polished by hand. The entire process requires nearly 30 days, creating a high gloss finish. The interior is lined with smooth faux newborn calf-hide. A luxury befitting a collection of timepieces worth displaying. Auto-Daily-Repeat with a pre-set timer. Automatic clockwise and counter-clockwise rotation. Winds almost all automatic watches. Does NOT wind Seiko Kinetic. Silent independent turntable motors and gears. Felt bottom lining to protect furniture surfaces. Dimensions: 9.000 H x 13.000 W x 15.000 L inches. Approximately 6 rotations per minute. Pre-packaged in white gift box! We are confident that you will receive a quality product. Let us know if you are not satisfied. In the event of a defect we may choose to rectify the problem by replacing a part(s), repairing the item or exchanging it. Our guarantee does not extend to those items identified as standard wear and tear. We strive to provide you 5 Star worthy product and service! If your order was placed within 24 hours, tracking may not yet be available. We want you to feel secure when placing an order. You don't have to worry about your item being lost or damaged in transit. Please refer to our Help section for details. We will not declare items as gifts. We encourage international buyers to review import details. We accept most items for return within 30 days of receiving your order. Please refer to the excluded items below. For lost items, replacements can only be processed after the carrier has completed the lost package investigation. Open items which are listed in our list of excluded items for return. (that have had more than one bag opened). (that have had bags opened). The item "AUTOMATIC WATCH WINDER BURL WOOD DUAL DOUBLE QUAD 8 + 4 STORAGE DISPLAY CASE BOX" is in sale since Wednesday, May 23, 2018. This item is in the category "Jewelry & Watches\Watches, Parts & Accessories\Boxes, Cases & Watch Winders". The seller is "easysource" and is located in Chino, California.